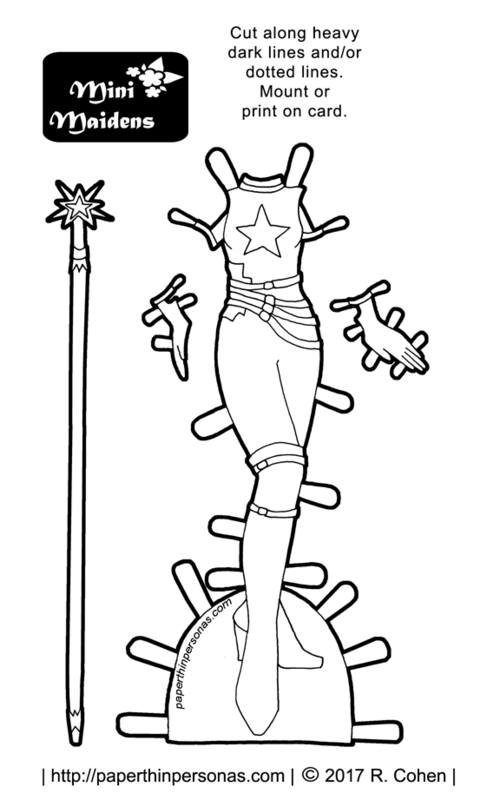 Today’s Printable Paper Doll Inspirations: Superheros! And Stars! The Mini-Maidens are getting their first paper doll superhero costume. I chose a star as the symbol and create the staff/wand to be her signature item. You can decide if it is a weapon or just a stylin’ accessory. I have a love hate relationship with the superhero genre. On one hand, I really enjoy exciting movies that require only limited brain power. On the other hand, I struggle with the common lack of repercussions in the genre. The total destruction of New York is pretty common (sometimes it is Chicago) and rarely does anyone pause to ask if the ends justify the means. Not to mention the fact that there’s a high level of sexism in the genre with female superheros regularly depicted in way that are designed to entice men rather than empower women. And I can’t recall the last superhero film that actually passed the Bechdel test (anyone know?) and so I find that the feminist in me struggles with the genre as a whole. Nevertheless, last year superhero costumes outsold princess costumes at Halloween, so clearly there’s a cultural shift in this direction. While some of my friends are excited, because superheros they see superheros as less problematic than princesses, I am not sure I agree. Both are problematic in their own ways, but I want to create paper dolls the reflect the world around me and the world around me is full of superheros. Plus, my patrons the Steger Family asked for them, so there’s another reason to create some more. Still, I’ll probably always have mixed feelings about superheros. I know its not supposed to be her, but the first thing I thought of when I saw this is Stargirl. I also always wondered where all the money comes from to fix the city after the superheroes are done destroying it. Do Tony Stark and Bruce Wayne pay for the damage out of the goodness of their hearts? Or are taxes ridiculously high to pay for infrastructure? Of have Stark and Wayne invented self healing material so the city fixes itself? There’s a very short clip at the end of Avengers where they scroll past a newscast and they’re talking about the billions in damage to NYC. Its kind of thrown in but I love that they mentioned it at all.